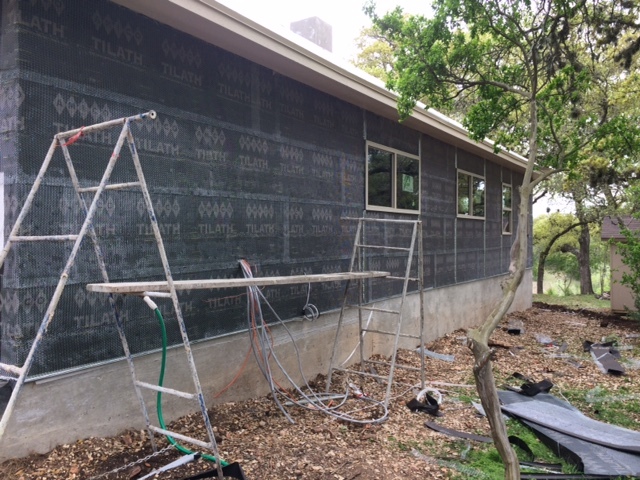 As we pack up our current home and wait for the closing, the outside work continues on our new home. Juan from UBuild It continues to keep us on track and provide valuable guidance. Paul Swoyer installed our septic system and sprinklers and Bell Hdyro Gas set our propane tank in place. 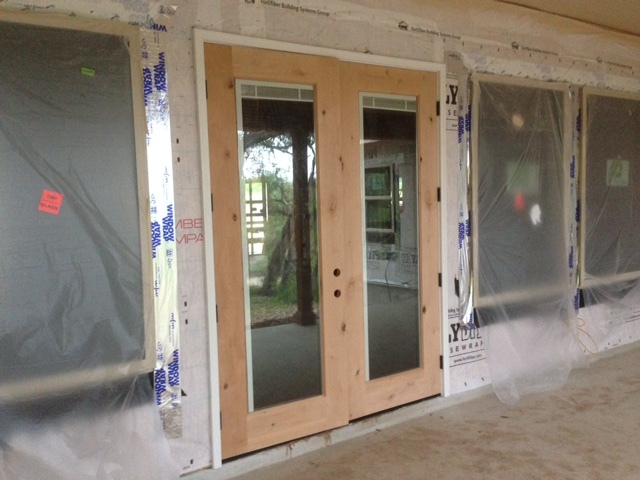 84 Lumber delivered and installed our exterior doors, along with the frames for our pocket doors. The front door is currently a construction door, to keep the side lites and glass from being damaged. They will be installed toward the end of the construction process. Both the front door and back patio doors are knotty alder. I love the wood and can’t wait to see how they look when they’re finished. 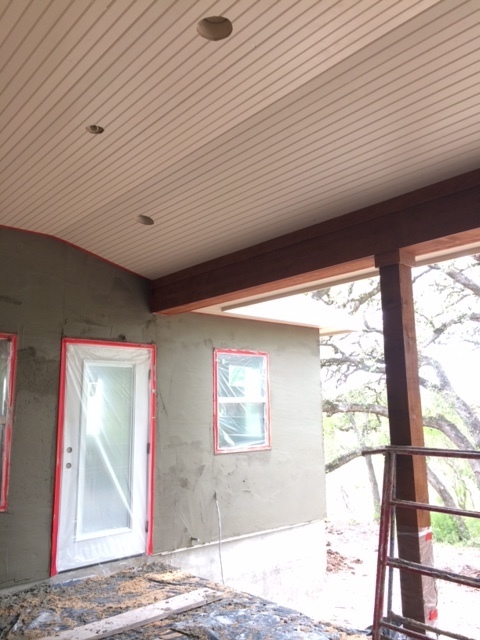 Fernando Delgado and his team painted our porch and patio ceilings along with our sofit and facia (Sherwin Williams Fresco Cream) and stained our patio posts and beams (Sherwin Williams Cider Mill). The light ceilings brighten up the area and the beams add rich texture. 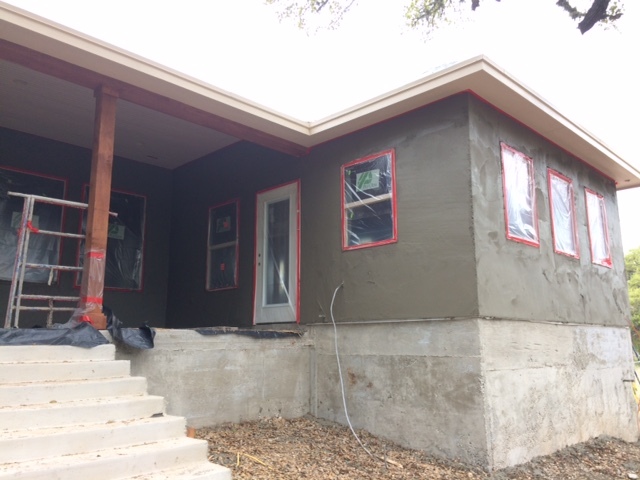 JDR Construction prepared the exterior walls with wire mesh and began applying stucco. They will complete it with a lace stucco texture and Sherwin Williams Craftsman Brown paint. 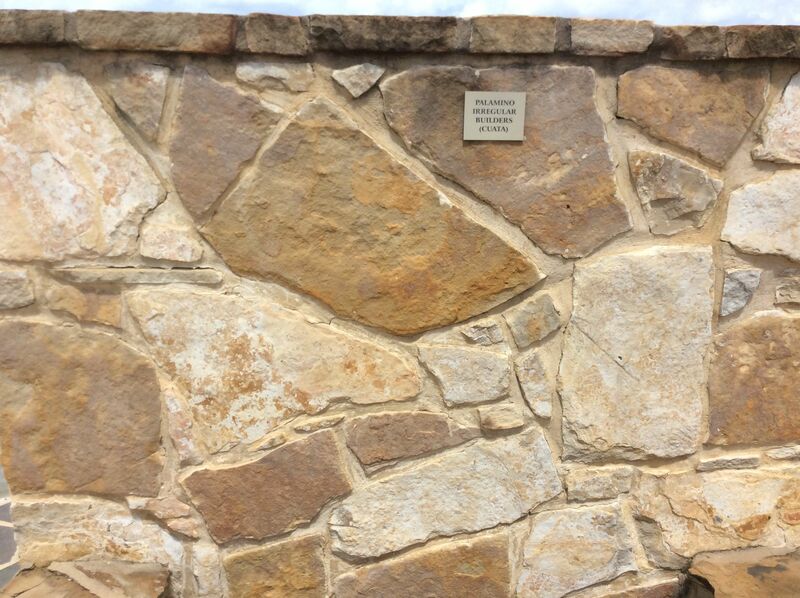 We also made a quick trip to select our rock from Brook Stone Ranch. The rock will cover the front of the house and also our fireplace and kitchen bar. We’ve chosen Palamino Irregular, a nice blend of reds, browns and creams. Looking forward to seeing how it all comes together. Our excitement and anticipation continues to grow as we spend more and more time at Oak Haven. This entry was posted in Hill Country Living and tagged 84 Lumber, Bell Hydro Gas, Brook Stone Ranch, Country Living, Fernando Delgado Painting, JD Rameriz Construction, Paul Swoyer, River Chase, Sherwin Willaims, Texas Hilll Country, UBuild It. Bookmark the permalink.